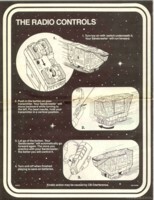 Help the scavenger JAWAS transport their DROIDS using Radio Control! 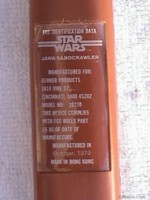 A genuine working replica of the tank-like SANDCRAWLER vehicle used by the JAWAS on the TATOOINE desert. Vehicle excitingly recreates the episodes of the unusual JAWAS. 16" long -- controlled by 2-channel wireless radio that operates up to 20 feet away. 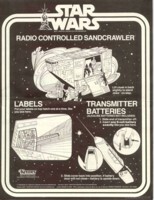 3 working wheels permit SANDCRAWLER to move in almost any direction. Roof hatch opens, revealing simulated "control" area and footpegs for several JAWAS. 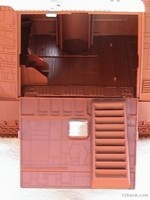 Side panel opens down and becomes step ramp into interior. 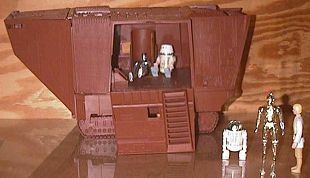 Room inside for transporting DROIDS R2-D2, C-3PO, R5-D4, or any STAR WARS Action Figure. 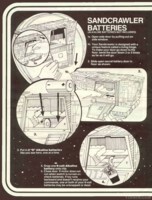 Manual elevator in underside lifts R2-D2 or other figures inside SANDCRAWLER. 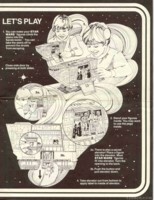 Those kids who were lucky enough to get one of these vehicles quickly found that its remote control action didn't offer all that much control. Unlike today's electronic toys, those of 20 years ago were very limited in range and function. 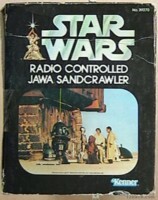 The Sandcrawler was of a design in which the vehicle was in constant forward motion until the remote's button was pressed. Activating the button stopped the forward motion and caused the vehicle to back up in a circle. When the vehicle was pointing in the desired direction, the button was released and forward motion resumed. Remote control assembly: body, battery cover, screw-on antenna. Side door opens to allow access to vehicle interior.